Colin O’Donoghue who plays Killian Jones aka Captain Hook in ABC’s Once Upon A Time is handsome, I’ll give him that. The blogosphere was abuzz with how Hook will give Rumple a run for his money, how he will be the biggest and baddest villain on the show. The problem with these theories is that Hook is flat whilst Rumple is rounded. Hook will be no match for Rumple due to Rumple’s multifoliate interior. Characters are of two types, flat and rounded. Flat characters are doomed to live their lives out in Flatland, the one-dimensional world created by Edwin A. Abbott and popularized by Sheldon Cooper in an early episode of The Big Bang Theory. That is to say, when looked at head on, they have shape and dimension, an appearance, names, a purpose, but when they turn sideways, they devolve into nothing more than flat lines, indistinguishable from one character to the next. Flat characters function as “phaser bait”, they serve a purpose, nothing more. They are the innocents Palmer and Michael (my characters) interview in their investigation that give up their information and then vanish, never to be seen or heard from again. They are Molly’s students who find an important artifact and then get about with their studying. They are the pirates who cheer on Hook in his bid to belittle Rumple and then fade into the background. They are the Milhas, the women who spur a duel between two characters, never to be heard from again. Last night’s Hook seems to have no motivation other than to kidnap women for the pleasure of he and his crew and then, later, to avenge Milha’s death. Or maybe it’s to get back at “The Crocodile” (a brilliant turn of events, nicknaming Rumple this) for taking his hand. OUAT’s Hook is narcissistic, and single-minded. Girls and wealth are his only motivator. Ever the round character, Rumple continues to amaze. All this time, the viewer was led to believe his sole motivation was to bring magic to Storybrooke so he could wield power over Regina, The Evil Queen. Now we learn his sole purpose is to overcome his cowardly past, to be reunited with those he loves and prove to them he is worthy. In a stroke of genius, the writers send Rumple to Belle to humble himself and apologize for his transgressions where she is concerned. He is a man who knows he is imperfect, someone who is capable of vengeful murder (Milha’s) and sweet gestures (giving Belle the key to the library), but at his core, he is a man whose sole desire is to be loved, and to love, but he doesn’t know how. Rumple looks upon people as possessions. He became The Dark One to keep Bae with him. He killed Milha (his wife) because he could not possess her. He imprisoned Belle in his dungeon because he feared she, like all those before her, would leave. Rumple’s motivation to bring back magic so he can leave Storybrooke and find his son is heart-achingly poignant and gives the character depth. Granted, Hook is a new character and we’ve only seen him in a single episode designed to facilitate getting Cora, Emma and Snow back to Storybrooke, and he will be fleshed out in the weeks to come. But so far, the simple fact that Hook was introduced to facilitate getting Cora, Emma and Snow back to Storybrooke supports my theory that he is a flat character. He has a purpose; he has no self-motivation to speak of thus far. Contrastingly, when we are first introduced to Rumple, he is already The Dark One, his origins a mystery cloaked in an impish exterior. He is jailed, he grants wishes, he is hated and revered by virtually everyone in Storybrooke. We know there is an age-old rivalry between he and Regina and we ache to find out what that is. Juxtapose that with Storybrooke’s Gold who may or may not remember his life before the curse, and Rumplegold is multi-dimensional from the start. 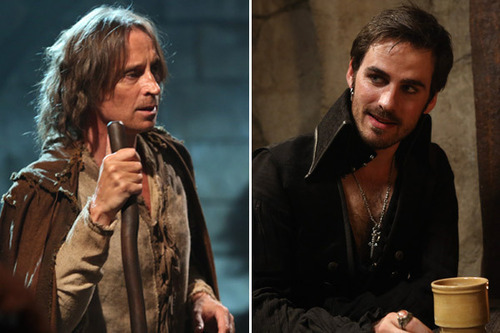 Last night’s OUAT opened a multitude of possibilities for the season(s) to come. I like that, unlike while watching so much formulaic prime time tripe, I never know what to expect. And even when I intuit the formula, I am still satisfied with what I see. Kudos to OUATs writers and actors, but especially to Mr. Robert Carlyle who brings justice to the character of Rumplestiltskin, a tragic hero if ever one there was. This entry was posted in Uncategorized and tagged abc, Bae, baelfire, Belle, captain hook, colin o'donoghue, cora, Emma, emma swan, flatland, killian jones, Milha, once upon a time, ouat, phase shift, Regina, robert carlyle, Rumplestiltskin, Sheldon Cooper, Snow, snow white, The Big Bang Theory, the dark one, Writing. Bookmark the permalink.